AquaSalt is 100% produced using the Evaporated Food Grade Salt Process in the two newest and most technologically advanced salt plants in the U.S.A. This process produces the highest purity salt possible. Our salt is so pure it is used in the pharmaceutical industry and is certified as USP Grade. 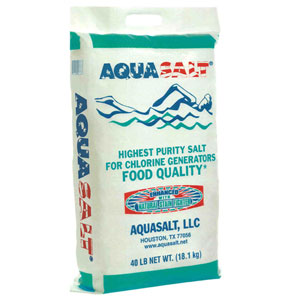 AQUASALT is the purest salt available for swimming pool and spa chlorine generators. The evaporated process is familiar to most people as table salt or food grade salt. AQUASALT is packaged solely for use in swimming pools and spas with chlorine generators and is not intended for human consumption. It is available in a 40 lb. bag. AQUASALT should be distributed over the greatest water surface area possible to result in the fastest dissolve rate. Follow the Chlorine Generator Manufacturer guidelines for quantity and frequency of adding salt. Avoid piling the salt on the pool surface and brush as necessary until fully dissolved. Monitor pH and adjust as needed. Monitor salt level and adjust as needed. Monitor conditioner/stabilizer level and adjust as needed. Clean your salt system cell after every three months of use. Contact us today for recommendations on the right product to fit your unique needs.